The EU General Data Protection Regulation (GDPR) replaces the existing 1995 EU Data Protection Directive (European Directive 95/46/EC), it imposes strict controls on how all organisations collect and process personal data within the EU and/or the personal data of EU citizens. We’re constantly improving the technical and organisational security measures we have in place to protect your data and are committed to being fully compliant with GDPR and our role as a data processor. Data is collected only for specific, explicit and legitimate purposes. Sensitive data is encoded whilst on and before it leaves your computer. Data is also further encrypted with AES-256 encryption locally and/or with us (optionally turned off). Passwords are stored with us as one-way salted hashes. SSL technology is used to ensure data is private during communication. Data is retained only for as long as necessary. Regular backups are made in-case we ever need to recover data. Personal data can be exported in a machine-readable format. A small percentage of our customers are not within the EU, in that unusual case we will have to send data outside of the EU to those specific customers - this is so they can edit their reports. The customers in some of those countries may also not legally be allowed to encrypt data, for that reason we have the option to turn off either local and/or server encryption for their data. The default for these settings are local off, server on. In any event data is also encoded and not stored in plain text. The settings for encryption are in Admin>School Details. The reason we recommend local encryption off is so that if you have a local hard drive fault then recovery software will have a better chance of working. An example of and abnormal condition that could arise and we would be forced to provide information to a third party would be if we are requested by the police/court for a set of past school reports for a particular pupil or if a school has asked us to directly interface with a third party support team that the school uses. Only a few select staff have access to the school licence name and password - our admin system checks their IP address as well as their password and will prevent logging in if incorrect. All passwords are stored using a one-way salted hash code - that is why we can't recover teacher passwords, just replace them. Our server checks IP addresses for direct data access and only allows specific IP addresses to directly log into the database, everything else has to go through our web api with requires the username and password to gain access. Full backups are made daily between 2am and 3am to a secure machine in a different building to the main server. The enforcement of the GDPR is overseen by the UK’s supervisory authority, the Information Commissioner’s Office (ICO). It ensures that everyone is playing by the rules and that the rights of data subjects - the people whose data is being processed - are correctly protected. We are registered with the Information Commissioner's Office in the UK (ID: ZA329948). A full copy of our data protection certificate and statement is available via their website. The information on the ICO website also encompasses our website and employees (usually marked as 'internal'). This is because the ICO website (in their words) holds only general information per company - it's not meant to be a concise document. Under the GDPR, those collecting or processing data at 'large scale', collecting or processing certain types of sensitive data, or who are a 'public authority or body' may need to designate a Data Protection Officer (DPO) and/or an EU representative. This is the person who we would normally contact regarding data protection. Administrators will see a screen similar to this if we do not know who to contact regarding data protection. 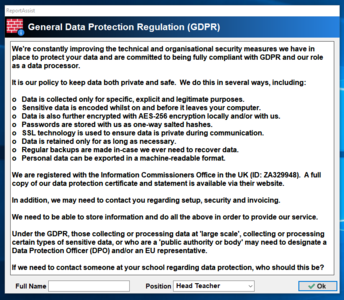 Within the program, administrators will also see a GDPR option in the Administrator menu that shows who and when you informed us who your data protection contact is. If you ever want to contact us about GDPR, data protection or to find out more about how we process your data, please feel free to drop an email to our Data Protection Officer (DPO) and they will get back to you as soon as possible. This page was last modified on 19 February 2019, at 21:19.